Customer relationships are important to us, and we regret that your experience was not a positive one. We understand that we have discussed your concerns and offered an accommodation. If you continue to have questions or concerns please contact us at customersupport@empiretoday.com. July of 2014, We called Empire Today. The pushy sales lady came to my house the same day. She did not leave until we signed the contract with her. The next day, i called the company and wanted to cancel because their price was very expensive, and they would not cancel. They gave me a couple of hundred dollars off the carpet and tile installation. We did not have a major problem with the tile people, but we started replacing the carpet August of 2014. 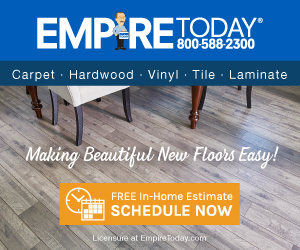 The installer was at my house July 28th and inspected my furniture and my house and the flooring to make sure that they have ordered enough carpet and to see how they would move the furniture. There were supposed to install the carpet the next day which would have been Tues July 29th. Based on his suggestion he said for us to start August 1st so that he can bring more people and that they can finish the job sooner on Saturday. I said okay. They started the replacement of my carpet August 1st 2014. Two people came and literally hostage in my house. They were using laundry room door and front door to come into my house. They put all the heavy furniture with no coverage on my front entry, which is marble which was in perfect condition before they started working. They moved the rest of my other furniture in my kitchen and in my breakfast area and we were held hostage because we couldn't use our kitchen and refrigerator and front entry. So, we were literally living on the front yard or backyard. We were not able to get into the house to see what was going on, or in some case use the restroom. At 7:30pm on Friday, we were informed that they would be back Saturday and he would bring 4-6 people to finish the job. They put some furniture back and some furniture on my front entry. Saturday Morning they came back around 11am and there were about 4-6 people working. We stayed outside again, and blocked out again hoping that they would finish the job today. Around 2:30 when my husband left the house to get something to eat, the installer came to me to tell me bad news, that they cannot finish the job today. This was because the carpet he had was different than the carpet he had yesterday. The color is the same, but the lot # is different. He wouldn't be able to match the seam and that I would be unhappy. All my upstairs furniture, they shoved it in the balconies of my master room and my daughters balcony, and he said that he feels really bad for us because he has to bring back the furtnaure to the room, but can't put the furniture back because he will be coming back on Monday to fix the problem. He brought everything from the balcony and shoved them more into the bathrooms and we were all blocked out of our closets and showers, and restrooms and changing clothes. Everything was shoved in a small place. The only place we were able to use was the downstairs powder room, which has no shower. And we were able to only use the kitchen and family room. He said he feels really bad, but Empire would take care of you and give me some kind of credit, which they did not do that yet. Knowing that he knew from the beginning that the carpet is not thick enough, and knowing that the carpet they gave him was not the right carpet, and also knowing that he would have to come back and re install new carpet because of this. Saturday August 2nd, 5 people had to sleep in the family room on the floor with no pillow and blanket since we had no access to anything in our house and everything was locked out. We didn't have access to tooth paste and toothbrush and had to go out and buy them since the no access. We had to use the powder room downstairs to brush our teeth. Based on his suggestion we had to call Empire today and tell them what was going on immediately. And since August 5th 2014, we are calling Empire and letting them know what happened and whats going on and little by little that 4 door stopper were missing in my house, the base board was brother, doors were not closing. Baseboard and walls and paint have been damages, and also couches. Also formal living room couches, and glass dining table has been chipped at so many places. The house was painted In Nov of 2013, and most of my pain upstairs have been damages, including the kids bedrooms, master bedrooms, etc. All paint is damaged, and all bedroom sets also have been damaged. The installer did not put all the screws on the bed, and the bed was loosened. The formal dining room and buffet which has been covered with sheets since we moved in have also been damaged with scratches and dents. The chairs and coffee table and side table have scratches and also book case and office and room desks have been broken. Also master place fire place marble have been damaged, and also the casing around the patio door because of the moving of the furniture. He broke the casing of the patio door in front of my husband, and told him he would come back and fix it but never did. All my marble have been scratched and chipped where the carpet meets the marble. There have been so many damages on the marble that I cannot describe anything. The staircase has been deeply scratched and it is so excessive that I do not know what to do about it. Small picture frames in the hallway fell and damaged the frame and also the wall. And bigger tapestry pictures have been broken due to being fallen. We have been following all the installers instruction to put things in box, and put the small items away, and I have 3 or 4 days to put things away. He never told us to remove any picture frames. Empire changed my flooring of my 5 bathrooms with the tile, and he also damaged the tile which was connected from my daughters room to the bathroom. There are so many chips in my kitchen flooring, and breakfast area. Pieces of the tile are gone, and he came back and shaved some of the pieces of the tile in my kitchen and laundry room to make the pieces straight. He did the same to my daughters bathroom, and for it to not be noticeable. But, I have more carpet there, more than tile, which you are supposed to have more tile than carpet. Due to the rolling in of the heavy carpet, my washer and dryer have been scratched and paint has been damaged. We have sent pictures to Empire, they have sent supervisors to my house to look at the damages, and each time they tell me they are going to fix the damages of my kitchen flooring and marble. They said they are going to order marble to replace your chipped marble, and someone is going to come and paint where has been damaged and change the flooring for kitchen and laundry room with the same tile of the bathroom. When the painter came to look at the damages, he said he has to paint the whole house to make it all even. For the stair case, even with sanding and staining, it will never go back to when it was normal in the beginning, so little by little they changed their mind, after all the promises Howie (installation supervisor), me to directly and Janet (Cus. Serve. Rep), to fix everything, they have only decided to give me 10% of the purchase price, which is about $830 dollars, and I rejected the offer. They reported this to installer insurance company, and they came over and looked at everything, and rejected the damages due to previous existing damages. What I want to ask them, is if the damages are pre existent, the first of installer should have told me and had me sign some sort of paperwork. The first installer came to inspect my house on July 28th, and if there were any pre existing damages, he should have taken a picture, and sign something like two other installers that came and changed the carpet again. Most of my furniture were new, and were kept really well since they were covered until the first installment. This tells any logical person, that there were no pre existing damages, and no furniture damaged. If so, he should have said something about it. After the second installer came to inspect the house, and when he was changing the carpet, while he was dissembling my bedroom set, purposely put the foot board and head board in the wrong place for me not to see the damages on my cherry wood furniture. I have trusted Empire due to the false advertisement on TV due to what they have promised. For the second time the carpet has been changed for the second time in Nov. 12th of 2014, the second carpenter took an hour to look at the furniture and the damages, and let me know the damages have been done previously to show me that they are previous damages, and he would not be held responsible. He did a terrible job of carpet installation. The cuts were horrible and easily seen and it took him 3 days to finish the job. He left the Friday at 4pm and said that this was the best he can do. Meanwhile we are paying for the carpet every month through Wells Fargo. We asked Wells Fargo to help us to get our money back through them, and Wells Fargo is not helping us and we are disappointed with Wells Fargo because they are telling me to deal with Empire and not them. Wells Fargo is a credit card company, and I don't know why they want us to deal with Empire, and Not wells fargo to get my money back for an unfinished job. Anyhow, now the carpet has been changed for the 3rd time. The supervisors name is Juan, and he came over. He said that everything is wrong with the carpet and it has to be changed for the third time. On June 10th, the carpet was finished. I called the next day. We still have a problem with the stairs, with the size of the nails, and the carpet is pushing out on both sides. I hope to never do business with Empire again. My life has been changed since August of 2014. I am still dealing with them and getting no where. I am calling them daily. It is frustrating not to get a response from them. I am only getting an email once in a while, and keep getting promises made but not getting any of them. Reason of review: all of the above . Review #669040 is a subjective opinion of vida.realestate.